Yesterday, The Alex Jones Radio Show had Jason Bermas back on to go over the latest news about World Trade Center Tower 7. Although Bermas slipped and said his first name on national radio, (with an international Internet audience) he is still refusing to confirm the identity of his source, or release the full 20 minute interview (until the unscheduled release of the Final Cut). Some people do not believe a movie release date is the proper timetable for truth. It is clear that the man on the tape is Barry Jennings, Deputy Director, Emergency Services Department, New York City Housing Authority. Mr. Jennings has already gone on the record. On 911 he was on the news covered with debris, like many survivors seen on television that day. Barry Jennings has put his full story on the record with Loose Change, and wanted to remain anonymous until the movie is released. If Jason Bermas had not said his name, that may have been possible, but that is no longer the case. On the morning of 911 Barry Jennings with Mr. Hess, one of Rudy Giuliani's highest ranking appointed officials, New York city's corporation counsel, (Hess is a Yale and Harvard graduate, a lawyer who has represented the United States in numerous major cases). It was just after the first attack on the North tower, but before the second plane hit the South Tower, when Barry Jennings escorted Michael Hess to the World Trade Center Tower 7. 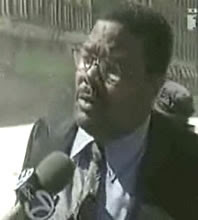 Mr. Jennings recalls a large number of police officers in the lobby of WTC 7 when they arrived. The two men went up to the 23rd floor, but could not get in, so they went back to the lobby and the police took them up in the freight elevator for a second try. When they arrived on level 23, at the Office of Emergency Management they found it had been recently deserted, "coffee that was on the desk, smoke was still coming off the coffee, I saw half eaten sandwiches". At that point he made some phone calls, and an un-named individual told them to "leave, and leave right away". Jennings and Hess then proceeded to the stairs, and made it to level 6, when there was an explosion, and the stairwell collapsed from under their feet, Mr. Jennings was actually hanging, and had to climb back up. They made it back up to level 8, where Barry Jennings had a view of the twin towers, both buildings were still standing. This is an important detail, as many debunkers have used Mr. Jennings statements out of context to claim the damage came to WTC 7 from the towers collapsing, not the case according, to Mr. Jennings. The interview has been cut off where they say how they made it to the lobby, but when they did make it down, Mr. Jennings found it destroyed and littered with dead bodies. He said it looked like, "King Kong had came through it and stepped on it, so destroyed, I didn't know where I was. So destroyed that they had to take me out through a hole in the wall, that I believe the fire department made to get me out." Shortly after he made it out, he was seen on several news channels telling his story. Mr. Jennings is still confused as to why Building 7 had to come down at all, and does not accept the official reason that the noises he heard were from a fuel oil tank, "I know what I heard, I heard explosions". Michael Hess has not made any public statements about that morning with Barry Jennings, perhaps we can call on wearechange.org to document Michael Hess's account of the events on 911. Since September 12 2001, there has been growing controversy surrounding World Trade Center 7. In the past few months more people are questioning the governments explanation, and the Main Stream Media's failure to ask important questions. In February the BBC's live report from 911 saying that WTC 7 collapsed a half an hour before the collapse had occurred was completely ignored by the MSM. Around the same time Rosie O'Donnell pushed her 30 million viewers to Google WTC 7. Now Loose Change has captured a 20 minute long interview with a completely credible source, this is huge news, and hopefully they will feel compelled to release some more of the interview. Alex Jones is the executive producer of the latest edition of Loose Change, thus disabling his ability to speak freely about the issue. Hopefully this and other reports will help get Barry Jennings to come out to the public as soon as possible.